Franklin, WI (For Immediate Release) - Hermle Machine Company of Franklin, Wisconsin, the North American headquarters of Maschinenfabrik Berthold Hermle AG located in Gosheim, Germany, will be introducing two new machining centers, the B 300 and the C 50 U, to the North American market, as well as demonstrating 5-axis machining of a variety of parts in Booth #A-8265 at IMTS 2008. Available in both 3- and 5-axis configurations, the B 300 has been called the "Entry Level Hermle." 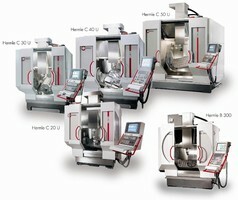 Incorporating select elements of Hermle's popular C Series machining centers including patented gantry design for fast, precise movement, trunion table, and a mineral casting base, the B 300 was designed to offer Hermle quality at a price point accessible to a wider variety of shops and manufacturers. The B 300 will be available at a special introductory price through the duration of the Show. Machine features include X, Y and Z axes at 800-600-500 mm, respectively; a 15,000 rpm spindle powered by a 19kW drive; and a 30-position tool magazine accommodating both SK 40 and HSK A 63 tooling. Tool change is by direct pick-up, and chip-to-chip time is approximately 6 seconds. The 3-axis version features a rigid clamping table, 1000 x 560 mm, with a 1500 kg capacity. The 5-axis version utilizes an NC swiveling rotary table, 280 mm in diameter with a 250 kg maximum load. The control is a pendant mounted Heidenhain iTNC 530, and a limited range of options is available. The machine demonstration will feature power cutting and 5-axis simultaneous machining of a large demonstration part. Other exhibits will include the C 30 U and C 40 U machining centers which have become extremely popular among complex part manufacturers since their introduction in the North American market. Utilizing the design features common to Hermle's C Series platform, including a vibration-dampening cast mineral base, modified gantry design, and a tilting trunion table, the C 30 U features axis travels of 650, 600 and 500 mm in the X-Y-Z axes, respectively, while the larger C 40 U offers axis travels of 850, 700 and 500 mm in the X-Y-Z axes. The C 30 U is equipped with a 280 mm diameter, tilting rotary table, standard spindle speed of 10,000 rpm, and capacity for 32 tools. A larger-size table, higher speed spindles, and additional tool storage capability are available as options. The C 40 U features an 800 mm diameter tilting rotary table with a 1,400 kg capacity. The standard spindle speed is 10,000 rpm, and 38 tool pockets are provided. Optional features include twin rotary tables, 420 mm table, high-speed spindles up to 40,000 rpm, and tool magazine extension to 195 tools. According to Kenneth Merk, Executive VP-Sales & Service, "As the advantages of 5-axis machining have become evident, many new players have entered the market. In addition to Hermle's proven designs and superior quality, we offer the customer extensive experience in defining and optimizing 5-axis applications in all sizes of parts and in materials ranging from glass to composite to the hardest new alloys. "The new B 300 is an answer to market demand for Hermle quality at an affordable price that will enable a larger number of shops and manufacturers to step up to a higher standard in 5-axis machining. Likewise, the C 50 U fills a need expressed by many of our customers who have resorted to specialized fixturing arrangements in order to accommodate larger 5-axis parts. "For over a decade, over 90% of our sales have involved 5-axis configurations. Today, our ability to offer Hermle's experience, combined with multiple sizes and price points, is winning new customers both inside and outside of our traditional base." For more information, please contact Kenneth Merk, Executive VP-Sales & Service, at 414-421-9770 or by e-mail at info@hermlemachine.com. Hermle Machine Company, located in Franklin, Wisconsin, is the North American headquarters of Maschinenfabrik Berthold Hermle AG located in Gosheim, Germany. The firm handles all sales support and service functions for a network of distributors located throughout Canada, the U.S. and Mexico. Hermle produces a wide range of precision machine tools noted throughout the world for their exceptional accuracy and high quality.